“… a marketing technique to create and distribute valuable, relevant and coherent content to attract and acquire a clearly defined audience, with the aim of promoting the profitable action of the client”. This is the definition of Content Marketing that we can find on the Internet usually. The key characteristics of a content are: valuable, relevant and consistent. And content becomes a profitable marketing tool only when people look for it, want to access it. Valuable content: something that is not even worth reading or seeing, something that is far from the requirements or interests of your target audience, can never interest the public. A content is valuable (a blog or a video) when it reflects the values ​​of the people, meets their needs and meets their requirements. Therefore, the creation of valuable content is one of the parties in the marketing of more important content. Relevant content: As before, your content must meet the requirements of your client / audience. It must be relevant to your services, products, your client’s interest. Simply, your content should be the answer to all your clients’ queries. Not only that, but it requires that the contents be catchy, captive and informative. Coherent content: constant content not only contained in a regular interval, but also requires consistency in the style of the content. When you maintain a style, presentation and a particular tone in your content, your visitors, readers and customers become familiar with your brand and experience. After all, good marketing solutions from impulsive content to action to everything that comes to your website. People want to do business with those who understand them and who have similar ideas. They believe in the recommendations of other clients, trust the contents and reviews of brands shared by similar companies in social networks. Content marketing offers companies the possibility to earn that credibility by sending messages that reflect how their service can generate a positive change in the client’s processes. Once you know what content marketing is, it is essential to know why the marketing of the pages is profitable for your business. Perception: before perception, each client has their own needs, but no children aware of the available solutions. Therefore, the previous content should make a reader / visitor have the solution of which he had no knowledge. Research: from now on, customers know the solutions and want to get more knowledge about the solutions. Therefore, your content should educate them and satisfy your curiosity. Consideration: after educating your readers, the content should be able to compare two or more products / services to ensure the best service at a fair price. Decision: Finally, your content must carry out the clients to the decision making and the process that contracts your solution and becomes your client. When a well structured and developed Content Marketing System is built, the ROI can be very high. This marketing strategy also offers additional benefits in other digital marketing channels. For this reason, many companies focus their efforts on implementing a good Content Marketing System instead of in other areas. 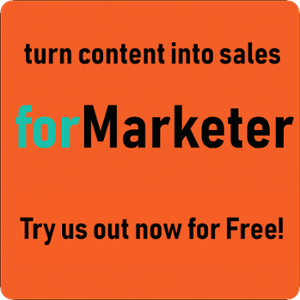 forMarketer. 75 Brodway. San Francisco, 94111 (USA). Copyright © 2018. All rights reserved.